A few years ago one of my sons awoke after having a nightmare that I was drowning. I comforted him that I was indeed okay. His shouts had awoken me from my own dream where a giant wave had covered me and I was floating underwater. You can imagine my surprise that my son was having the same dream as I was, but a different experience of the dream – almost like he was on the shore watching. I did not experience my dream of being underwater as fearful because I knew I wasn’t drowning in my dream. So is that experience coincidence? Or how is it possible that we could have the same dream at the same time? I think everyone has a story about something that has happened to them that is unexplainable by the boundaries of science. It’s not to say that science couldn’t explain these things in the future, but currently there are many limitations in what can be measured and validated. 3 great books that explore mystical or magical experiences more in depth are Men Who Stare at Goats by Jon Ronson, Real Magic by Dean Radfield, and The Power of Eight by Lynne McTaggart. This book is written by a journalist who meets some interesting characters who have worked for the U.S. government to study if “magical” methods can be used in the armed forces. There is a movie loosely based on the book with George Clooney & Ewan McGregor. Individuals were taught the skill of remote viewing in which they go into a meditative state to gather sensitive information from other countries or armies. Both the book and the movie do a good job of letting the reader/viewer decide what they want to interpret as truth or fiction. 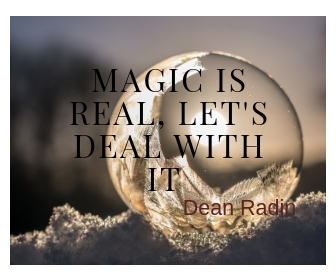 Dean Radin recently outed himself as scientist who studies magic. In actuality he has studied magic for decades, but used to call it the studying of psi or parapsychological phenomenon. In reality, magic could be anything that happens in our world that cannot be explained by science. He gives many illustrations of documented experiences, his own experience with intention & synchronicity, and of course science to explain some of this phenomena. If you’re more of a science-minded person, this a great book because he explores the stigma of studying paranormal phenonmena in the realm of science. He explores scientists firmly-rooted fears and experiences of losing credibility when they share scientific research that states the opposite of what they’ve been taught as true. Science can become dogmatic, and Dean shares his own experience of being in the situation where scientists reject facts because it doesn’t fit with their personal beliefs. Lynne McTaggart is a journalist who is an expert on the research of the “science of spirituality”. She is best known for her book The Field. Her newest book, The Power of Eight, chronicles the science of what happens when a group of people focus their intention on healing a person. She is hard-wired for scientific explanations, yet finds herself experiencing miracles in her workshops when small groups of 8 focus their intention on healing a person. She documents her journey and her more empirical work starting out with plants and then working more broadly. If you belong to a prayer group, this all may come as no surprise to you, and for the non-spiritual person this will give some credibility to this practice. What kind of experiences have you had that you’ve brushed off as coincidence or maybe have had others brush off as nonsense? Once you open the door to exploring these elements of life, it’s likely that your lens of the world will start to shift dramatically. Want some free online resources about the science of energy healing? Check out my other blog post, Must-read sites about the science of energy healing (that are free too).